Just returned home this evening, after attending a residential workshop conducted by PIM over the weekend, at Pegasus Reef Hotel Wattala. It was altogether a great learning experience, and had lot to take out of all the sessions we were exposed to. Here are some pictures I took at the Pegasus Reef Wattala. And if you are driving from Colombo, it's only about half an hours drive, unless you caught up in a traffic jam or a road closure (Which are very common incidents in Negambo road). This is a screen shot from Google Earth's view of the area. I'm sure, the location map for Pegasus Reef Hotel on their official website is not clear enough. 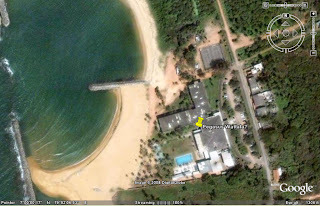 (Infact, it shows that the hotel is located somewhere in Gampaha District Sri Lanka!!). 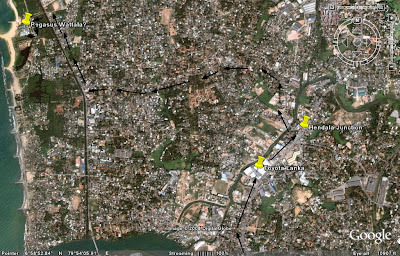 So, here is a proper location map of Pegasus Reef Hotel Wattala, if you are driving from Colombo.